This one is a few months late. The truth of the matter is; until recently, I didn’t know this anthology was released back in August by Barbwire Butterfly Books. In any event, my short story “Gnomus” was reprinted in this tome. Take a gander, if you like. What urge brought you there? Were you drawn to a particular item on display? Did it call out to you? Though everything inside was for sale, did you consider how much you were willing to spend? Perhaps you proffered the listed price, or perhaps you haggled the price down a bit. But did you consider the imperceptible fine print? You may just find you’ve paid a great deal more than what your parcel is worth. The following twenty-seven works chronicle such transactions. When you purchase this anthology, be sure you’re only paying the listed price to a reputable dealer. Otherwise, I cannot be responsible for the consequences. 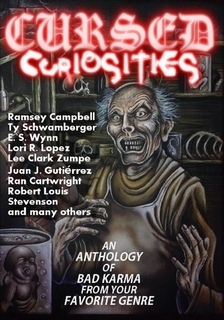 You can learn more about this anthology and pick up your own Trade Paperback copy HERE.